This church sits on a little hill not far from the Yare, in that area south of Norwich which has the largest concentration of medieval churches in Western Europe. This is partly because it was the most densely populated area of England at Domesday, but also because the very nature of the lands between the Yare and the Waveney, with rivers and creeks giving access to settlements for trading, and a network of lanes connecting fields, lent themselves to a large number of smaller landowners. These landowners did their best to emulate the great Norman churches arising at Norwich, Binham, Wymondham and elsewhere, and in so doing left a legacy that survives in some of the best Norman doorways in the country, but also in the sheer number of churches. Under the circumstances, it is not surprising that some have been declared redundant. Perhaps the only surprise is quite how many are still in use by the Church of England. St John the Baptist is in the care of the Churches Conservation Trust, a tribute to the fact that it is architecturally more significant than many of its neighbours. 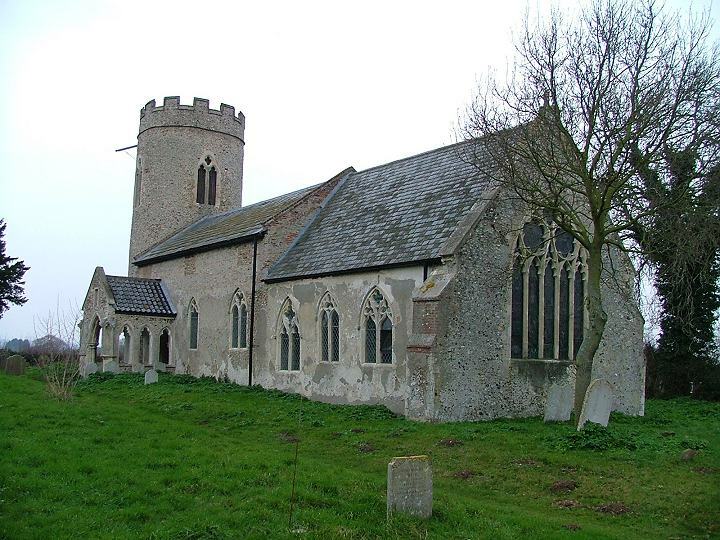 As the CCT guide observes, this is partly because of the amount of money lavished on it by the de Kerdiston family in the 14th century, while the following century, a period of major church rebuilding elsewhere in East Anglia, barely touched it. This may be because the manor was by then in the hands of the fabulously wealthy de la Pole family, and as absentee landlords their priorities may have been elsewhere. Major repairs and restructuring are recorded in the late 17th century after the re-establishment of the Church of England. The Manor had been in the ownership of the strongly puritan Gaudy family during the Commonwealth, and expenditure on church buildings had been looked on with some suspicion. Curiousities arise as a result of these repairs, even puzzles. We'll come back to them in a moment.Hellington benefited from an extremely early 19th century restoration, a thoughtful one of about 1840 and an extremely late one that removed the more objectionable features of the first. There appears to have been a succession of High Church Rectors here, some, ironically, members of the Denny family who had been vociferous puritans and supporters of the iconoclast William Dowsing just two centuries earlier. However, there was never a middle-brow minton-tiles and coloured glass spoilation of the interior. The most striking sight as you enter the churchyard is the porch. It is so unusual that it tends to have church historians hedging their bets. Cautley thought it interesting, Pevsner spectacular, both of which are undeniable. Decorated period porches are not unknown in this part of Norfolk, but they are unusual, and the sheer proportions of the porch, particularly against that Norman doorway and the great round tower beyond, make it an object for contemplation. Those massive angled-niches, for example. Not only are they completely out of proportion, but they appear to have broken springings for vaulting at their tops. Further, the springing points forward, suggesting that originally these niches were inside a vaulted structure. Also curious of proportion are the large ogee-headed arches in the walls - did they ever contain glass? And finally, given that the structure is so enormous, why is it too narrow for the Norman doorway? It cuts into it on either side. Surely no 14th century mason would have done such a thing. Before considering the possibilities of what might have happened, it is worth taking a look inside. Like all CCT churches, the interior is simple, clean, well-kept. The great decorated east window fills the chancel with light even on a gloomy day. There are lots of little details - curiously elborate chancel arch capitals, with a headstop facing east, an exceptional puritan brass to Anthony Gaudy, featuring a delightful little tortoise as his symbol and a fine benefactions board at the back of the church. You step into the light of the chancel, and look back into the nave. It seems older than where you are standing now, and is probably essentially the Norman church, its walls extended upwards - you can see the blocked 14th century clerestory from outside. The chancel is quite different, a creamy, sophisticated place, as long and wide and tall as the nave against which it stands. The enquiry into the state of the chancel that preceded the restoration of the late 17th century throws up an intriguing, crucial detail. The Bishop wanted to know who would be responsible for the upkeep of the western part of the chancel - the parish or the rectory? This was because at some point the roodscreen had been moved eastwards from the chancel arch to about halfway up the chancel. Why was this done? We know it was originally in the arch, because the fitting holes are still there today. Paul Cattermole, in his exceptionally rigorous guide to the church, suggests that it was done in the 15th century to accomodate a larger congregation, instead of rebuilding the nave with aisles - rather, they would be allowed to flow into the western part of the chancel. This sounds convincing, but I think it is flawed. Firstly, in common with the rest of Norfolk, the population of this parish was actually much smaller in the 15th century than it had been 150 years previously. If it followed the common pattern, it would probably not return to its pre-Black Death levels until well into the 17th century, reaching a peak for the 1851 census, before fading away. Secondly, it would be a really unusual thing to do. I have not come across a screen moved eastwards in the 15th century anywhere in East Anglia - indeed, the opposite is sometimes the case. And aisles were not built on to churches to accomodate larger congregations, but to allow the full panoply of processions required by the late medieval liturgy. Aisles were a luxury, and their existence is usually the result of bequests. Such bequests were apparently not made here at Hellington, but we know that the Manor was in the hands of a fabulously rich family with a reputation for doing extravagant things to churches. If there had been need here, can we assume they would have done something about it? I wandered outside in the thick undergrowth thinking about what might have happened. This must be a verdant graveyard in late spring - the elder was already up to my knees in February. I took a look at the Norman north door, not as extravagant as that to the south, but exposed completely, unlike its companion, under that porch. I thought at first that the porch might have been a 19th century confection. But Ladbroke drew it in the 1820s, and Higham ten years earlier, so it was certainly here before the Tractarian restorations which would have loved such a thing and would have been capable of concocting it. Higham found it lined with stone benches - and yet, it is so wildly open to the elements. And then I thought about that chancel screen being moved. At the time of the Anglican reformation in the mid-16th century, chancels fell into disuse as the new liturgy demanded a holy table lengthways within the nave. Archbishop Laud, in the early 17th century, reinstated them, insisting that altars should be placed sideways against the east wall, and hemmed in by his innovation, altar rails. Laud's enthusiasms were one of the factors that led to the Civil War, and the supression of the Church of England. After the Restoration of the Crown in 1660, the Anglicans were back in charge, but there was never a widescale return to Laud's reforms and chancel use. Indeed, for the next 150 years the focus of Anglican worship would be the pulpit, not the altar. And yet, many chancels survived. The main reason, of course, is that they had a number of other possible uses. Some became schools, others vestries, others meeting rooms. Laud had not require the return of screens where they had been lost, but most parishes found them a useful way of dividing off the chancel, which is why so many survived. Because the Church of England retained many administrative structures from the Catholic Church that preceded it, there was a difference in funding arrangements for upkeep of nave and chancel. The nave was the responsibility of the parish, and its repairs were funded by the parish rates. Care of the chancel came from the rectory; that is, the income of the minister or his patrons derived from tithes. This was what the Bishop of Norwich was querying - in the years after the Commonwealth, when church records were in a state of disarray, what was the position at Hellington? Historically, where had responsibility been demarcated? Had the chancel been deliberately shortened to pass the costs of its western part on to the parish? This leads me to suspect that the screen was not moved during the 15th century, but during the 17th, probably at the time of the commonwealth, to provide a smaller room in this vast chancel that could take on the functions carried out by many other parishes in their porches. This was either because there wasn't a porch at the time, or it was unsuitable for such uses, perhaps by being too small. And so, the million dollar question - when was the current porch built? I don't think a medieval mason would have joined it so badly to the Norman doorway. And yet, there is a small niche on the front of the porch, which would not have been necessary after the Reformation, until the Victorians reintroduced such things - but we know the porch existed in substantially its current form more than 20 years before the Victorians. And so the front of the porch is medieval. But then, there are those fabulous angled niches, which clearly were not there originally. Coming around to the south side, I looked again at the porch. I tried to work out why the three openings in either side didn't look right, and I decided it was because they are too far apart. It looks more like a collonade. To my eye, what has happened here is that someone, at some point, has used Gothic features to create Classical forms. It suddenly struck me that, although the front face of the porch is the original from the 14th century, there is no reason for the east and west walls of the porch to be from that time. I think that at some point the entire porch was demolished apart from the front face. It is a fairly plain, simple front, and there is no reason to think that the other walls would be more elaborate. The east and west walls were replaced by the six Decorated openings, three on each side - but because the stonework was thicker than the original flint, they had to be cut into the Norman doorway to fit. At the same time, the angled niches, which like the openings came from another building - nearby Langley Abbey perhaps? - were stuck at angles onto the front of the porch, wholly out of keeping and proportion. When did this happen? Because of the dividing off of half the chancel by the screen, which remained in place until 1840, after which time churches no longer had such an administrative role, the porch was not needed for parish business; and so I think this splendid, fascinating and yet essentially useless structure is the work of an enthusiastic 18th century antiquarian. But I don't suppose we will ever know for sure.